When Cathay Pacific launched in Sydney some 40 years ago, it drew a glamourous crowd. From the likes of then Aussie cricketer Dennis Lillee to a plethora of pop stars, flight attendants, pilots and even adland pro, Leo Schofield was among the mix. 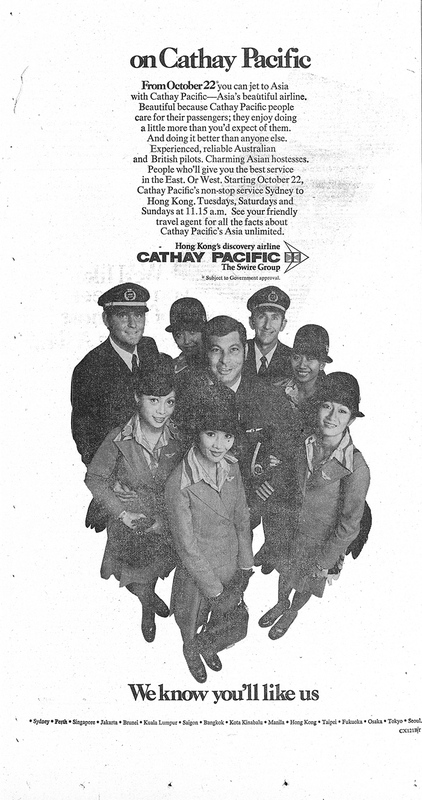 The thought may be that brands partnering with pop stars and creating experiential events to bring the brand to life and create opportunities to engage directly with the public is all very new, but back in 1974 when Cathay Pacific Airways was getting ready to launch the first of its three-times weekly non-stop service between Sydney and Hong Kong, the airline did it all. In the lead up to the first flight on October 21 that year, the airline enlisted a group of its own pilots and flight attendants to tour Australia with Cantonese pop star and actress Frances Yip and, curiously, a 22-man Gurkha pipe band. The promotion began in Perth and travelled to Adelaide, Melbourne, Hobart, Canberra and Brisbane, before arriving in Sydney. 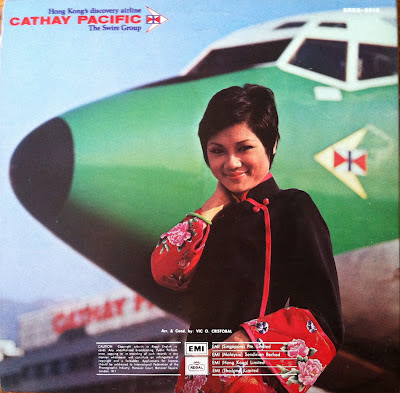 Earlier that year Frances Yip had recorded a Cathay Pacific branded album ‘Discovery’ featuring the title track, a song about flying with the airline, and had others tracks about destinations on the network with Australia represented by “Waltzing Matilda”. They were all part of a Cathay Pacific show in which Frances sang, the flight attendants took part in fashion shows wearing their national costumes and the British and Australian pilots spoke reassuringly about working with the ‘oriental’ airline. Leo Schofield was then the copywriter for the advertising campaign and says 40 years ago, it was important to talk up the credentials of flight crew. 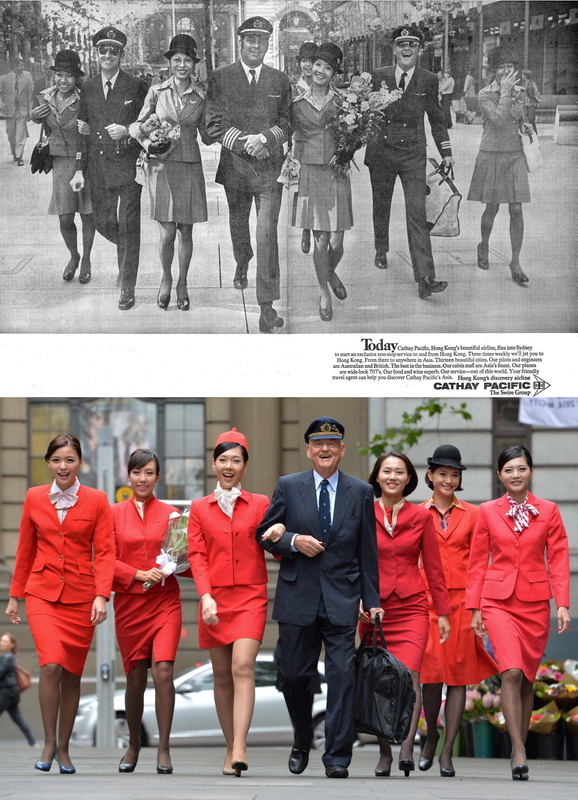 “Australians were used to flying with Qantas or British Airways, so we wanted to reassure them that Cathay Pacific pilots were just as reliable and skilful in the cockpit, and had attentive flight attendants as well, so we wrote the line – ‘You’ll fly with people who care – experienced Australian and British pilots and flight engineers, charming Asian hostesses,’” he says. While they were in Sydney in preparation for the first flight from Sydney to Hong Kong, the flight attendants and pilots worked hard. Along with the promotional tour, fashion shoots and interviews, they were photographed and filmed for the airline’s advertising campaign. Australian Captain Hal Dyball who is now retired was one of the pilots whose face was consistently seen in newspaper advertisements, on posters and TV and cinema ads. Meanwhile in Hong Kong, promotion of the new Sydney service included Australian fashion parades and cricket clinics taught by none other than Dennis Lillee and Rodney Marsh. The inaugural Hong Kong-Sydney flight included leading dignitaries of the day as well as a number of journalists, and similarly the return flight from Sydney (crewed by, then, First Officer Hal Dyball and others from the promotional tour) included journalists and the Daly-Wilson Big Band booked to continue the celebrations in Hong Kong.